Hydraulic fracturing, or fracking, is an innovative and cost-saving process for drilling oil and gas from rock formations far underground, and is a booming industry in Michigan. Proponents say fracking is safe and note its positive impact on the state economy. Critics say the process carries risks, both known and unknown, to Michigan’s water supply and public health and should be more closely monitored by regulatory agencies. There are enough fossil fuels “locked” in bedrock shale formations under North American soil to make the United States energy independent, and a net exporter of oil and gas, in the near future. Tapping those energy sources would make the United States less dependent, economically and politically, on unstable countries such as Venezuela and the Middle East. It would also enable the West to be less dependent on Russian natural gas, which Vladimir Putin currently uses as a political lever. The natural gas industry claims that fracking is safe because the shale formations lie far below the water table and pose a minimal threat to groundwater. They also claim that drilling for oil and gas is nothing new: we’ve been drilling for oil and gas for decades. Using natural gas to heat our homes and power our cars releases far fewer carbon emissions than coal. Proponents describe the growing natural gas industry as an environmentally pragmatic “bridge fuel” that will buy time until we can harness the power of wind, solar and hydro on a mass scale. In places like Kalkaska County, the oil and gas industry is big business, providing hundreds of jobs. Many of those contractor and subcontractor jobs are tied to fracking. Because fracking involves pumping a concoction of water, sand and chemicals into the ground to break apart the bedrock, environmentalists and private landowners worry that those chemicals could reach, and poison, the groundwater. Companies are not required to disclose the chemicals they use, or the formula of the mixture, in the process. That makes it difficult for local residents, or first responders, to prepare for an accident or emergency, and difficult for scientists to gauge the threat posed by the chemicals. In Michigan, as many as 35 million gallons of freshwater are removed from nearby aquifers per frack well — the highest rate in the nation. The Anglers of the Au Sable, a Michigan environmental conservation group, and others, worry that this will deplete freshwater sources and potentially dry up rivers and streams that are key to Michigan’s ecological health. Water for fracking is typically transported to well sites using heavy trucks, which turn pristine rural areas into industrial highways. The fracking, itself, is conducted day and night, causing both noise and light pollution for some nearby residents. The stakes are rising. 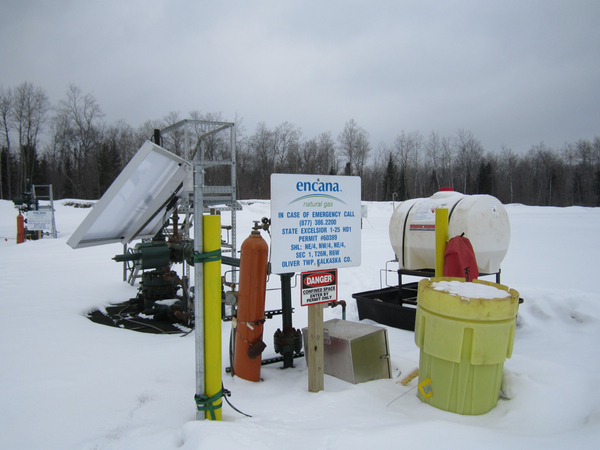 According to environmental groups, energy company Encana’s push for the Michigan Department of Environmental Quality to allow “resource play hubs” (multiple drilling wells from the same site) could exponentially deplete the local water supply. Disclosure: John Bebow, CEO of the Center for Michigan, of which Bridge is a part, is second vice president of the conservation group Anglers of the Au Sable. Bebow had no role in the writing or editing of this article, nor in the writing or editing of Bridge’s coverage on fracking. According to http://www.watershedcouncil.org/learn/hydraulic-fracturing/concerns-tieh..., "Based on current activity in Michigan, an average of 7.5 million gallons of water are used to fracture each well." 7.5 million gallons of water is a whole lot less than the 35 million gallons of water reported in this article. Which number is correct? Is the water ever reused in other wells? If the water can be reused in other wells, then this is water not pumped from our fresh water supply. Why is surface water not used for these operations? EB, thanks for your comment. Here's the source of the 35 million figure: the Black River Conservation Association wells recently applied for in Kalkaska County propose over 35 million gallons per well. That would be more than any well in any other gas/oil play has used in the entire country. Saving Great lakes water? Another good reason to block the Chicago Canal in addition to stopping Obama's Carp from the great lakes. Beyond that I hope the folks whining about fracking aren't using fossil fuels to heat their homes and fuel their cars, it gets tedious. One should never engage in an activity where the consequence of failure is intolerable. We don't do nuclear any longer because people finally came to understand that high-stakes technological failure is not a tolerable option. Fracking is an activity full of obfuscation and distraction, and another instance where the political skids have been greased to eliminate local opposition - and for good reason. If people fully understood and were fully informed as to the consequence of failure, and had the right to say "no," few would accept the trade-off of their access to clean drinking water for few temporary jobs and the right to thumb our nose at Putin. The 35 million gallons in the article are what was requested in the permit application. Saying that 35 million gallons "are used" is misleading. The companies apply for that amount in the event of some emergency which allows them to use more water without the waiting required for the DEQ to process another application. Hi John, I believe what it says that up to that amount can be used, not that that is the average. David, I do not contend that the article says that 35 million is the average, but saying that 35 million gallons are removed per well is not accurate. The one well which used 21 million gallons is the one pointed to as the record in the country, and while that is a record, it is not 35 million. "In Michigan, as many as 35 million gallons of freshwater are removed from nearby aquifers per frack well" Not true. There are no pros to fracking. In the past six years, North Dakota has gone from 38th in per capita income to sixth. The state's 3.1 percent unemployment rate is the lowest in the nation and nearly a full point below second-place. And McDonald's franchises in the state are offering jobs up to $15 an hour with benefits, vacation and even a signing bonus. In Pennsylvania, 150,000 new hires have been added over the past three years in the natural gas industry and the average salary is about 30 percent higher than the state median.